I have used the Victorinox sharpener 7.8715 for three years with good result. It is a type I call a fast sharpener. To be dragged or pulled along the edge. I will talk some on this type of sharpener and my impressions. The inserts are made of cemented carbide and it can be used on a wavy, plain or chisel edge. It can be used on the 84mm and up as well as the kitchen knives. It is important when using this tool to have a medium pressure and to pull straight and steady. If you use much pressure down upon an edge then it will or may shave off to much metal and if you do not have a steady pull then one may fold or get an edge that will be uneven. 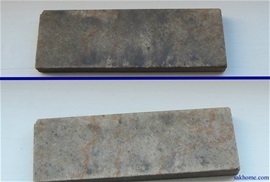 When strong pressure or force upon the edge then it may get damages and remember that the pressure will be between the inserts and the edge on a very small surface. This may damage an edge and actually fold the metal. Much pressure will or may result in shaving off metal at only one side. That may sound negative but actually if you use light to medium pressure and use a steady motion then it will perform very well and be useful. Most people never use a sharpening stone or a rod so with some small practice the 7.8715 will be well. After you get the edge that is sharp then use it again with very light pressure some times to smooth the edge some. 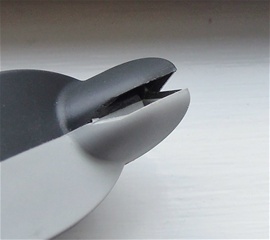 It is usually very difficult to get a perfect edge with this type of sharpener and by this I mean if you rub the finger nail along both sides then it is very normal to find a small irregular edge. This can be removed by using the light pressure like I explained but it will usually never be perfect. Then it is the part with a SAK blade that is not even because of the design. This irregular line will also come on straight blades and the wavy edge on a kitchen knife. There is absolutely nothing wrong with the quality on the Victorinox sharpener, it is well made and with good components that is durable. I have used it on many knives. I have two them + I had much practice with the Accusharp type that is many years old. I have rotated the inserts in the Accusharp after many years of use. The Victorinox sharpener is good! I always recommend for people to learn how to use a water stone or a diamond stone or rod. What can be done after using the 7.8715 is to use a round diamond rod with light pressure two times on the edge to remove burr and the irregular line. I would recommend using the 7.8715 just from time to time and not all the time because of the folding problem with the edge. On the Swiss Army knives it must be used with extra care. Then a very important part! Remember to clean the area around the inserts with a brush and water. Oil and dirt will or may result in an uneven edge and or maybe it will only shave off metal at one side. Solid construction with a very good finger guard! A dull knife will not perform correct and one will have to use force to cut. It is best to sharpen Your knife regularly. Never use this on a Swiss Army Knife because it will fold the edge and even with much practice it will cause damage. This Arkansas stone also got a groove track on the side for sharpening fishing hooks. This little stone is a formidable tool! A medium Arkansas stone will work very well and it got very little weight. It is small in size and it can be used on many knives. It need some cleaning because i have used it much on different knives. The diamond rod in a pen format is a smart tool to bring with you. It got two sides with the other hidden in the tube. The sharpener got one flat part and one semicircular part. 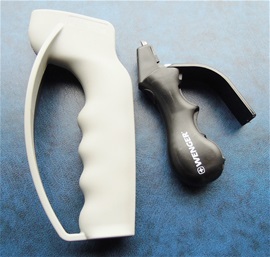 The sharpening tool can be almost completely hidden in the tube. The groove track is for sharpening hooks and more. 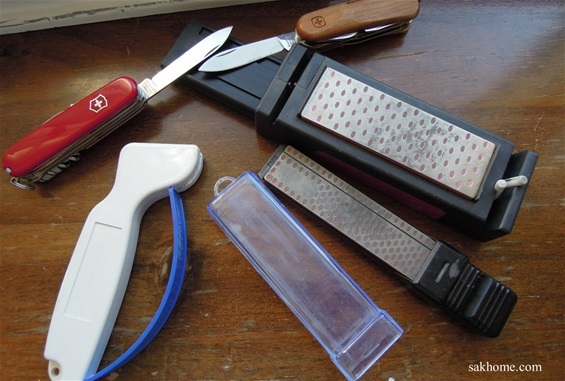 On the picture above are some of my sharpening tools that I have used for many years. One of the fine diamond sharpeners is now worn completely down. They last for a long time and I recommend with a SAK to sharpen regularly with the fine surface. Diamond fine surface about 800 works very well on a Swiss Army Knife. The old Accusharp fast sharpener has been a very good quality tool. Wenger and Victorinox blades sharpen easy and only light pressure is needed, it can be difficult to get the flat edge with a small stone. It is not needed with water or oil on a diamond sharpener, just use it dry. Remember to clean it from time to time. With the Arkansas stone it is best to use some water or oil. It is important to clean the Arkansas stone, i use a toothbrush with some soapy warm water. Rinse much. I may have to clean this one more time. It is easy to see on the picture why it is important to clean. The edge and its abilities are depending on the type of steel and the dimensions. No matter if you are using natural stones or diamond coated stones you apply the necessary pressure to remove metal to get the correct edge again. In my opinion the size of the stones and weight of them influences the results. If the stones are extra heavy then it can be a bit difficult to apply the correct pressure without practice. Then it can be smart to use the stones on a table. When the stones are very narrow and extra light then it can be a bit tricky to get the edge flat without becoming convex. Round stones or narrow stones can in some cases also be difficult to apply correct pressure with. A very small contact point may deform the edge and not sharpen it correctly. Almost all such problems are solves with using very light pressure. The strength of the edge depends on correct angle and correct pressure. Because during the sharpening process you can by wrong practice get a sharp edge but not a durable one. If the metal get compressed and bent back and forth then it could be a less durable edge. 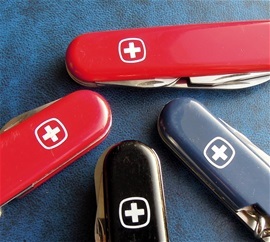 Traditional Swiss Army Knives and the pen blades got delicate edges with precision. From practice I learned that fine diamond coated stones with some width and by using the main hand holding the stone and movements I got the best results. Hold the SAK complete still with a firm grip. The advantage with diamond coated stones is that it removes metal very easy with very light pressure. It is a match made in heaven. It is possible to get the blades sharper than the factory edges. The result will or could be a less durable one. If you touch the edge up from time to time by following the factory edge and using fine diamond stones then it could be the best in my opinion. If you touch it up with a finer than 600 grit stone then you remove less metal and maintain it longer. The magic grits are 600-1000. If you have used a 600 grit stone for a long time then it will become smoother and finer. This can be used with a very good result. It is fully possible to use all kinds of sharpeners no matter what size and form. It is the pressure you apply that determines the results. The Victorinox fast sharpener works very well if you use it correct. 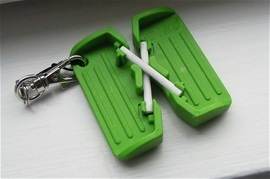 Victorinox also makes a smaller one that could be better for the pen blades. The large one is made for almost all blades none the less. A very good tip is that after using diamond coated stones that you remove the burr and remains from the process. If you gently slide the edge after on the fast sharpener carbide angle then you can bring out some extra sharpness. Fast sharpeners are quality made. The biggest problem for me is that the contact parts are so small that it will be very difficult to apply gentle pressure. The hand pressure that removes metal may cause too much pressure on a very small area at the time. It all depends on preferences and when you learn to sharpen with stones you are more correct. It also depends on the user if he or she is extra careful or not. If you use the fast sharpener touching up the edge then it will do the trick for a long time with correct use that is. If you use it on a damaged and uneven edge then problems may arise. In some cases it will bend the carbide angle towards one side and remove metal from only one side. The fast sharpener is a quality made product and if you use the large one or small one then they are best for touching up an edge. At one point the edge must be restored with stones. Fast sharpeners with carbide inserts are very useful tools. They are extra good for people that are less experienced with sharpening. It is very important that you look on what is going on at the edge during the process and that you use little pressure. Make sure that you check for chipped areas and so on. The Victorinox fast sharpener can be used on serrated edges as well. That said it is obvious that in time the waves and serrations will be changed because of this. The reason for this is simply that the sharpener will only remove metal from the edge part. The design of the waves and serrations will not be completely sharpened. Take a look on my pages on sharpening to the left and learn all you need to know about such edges on SAKs. In the human history and as long we have had steel people used and looked for abrasive materials that could be used for maintenance and sharpening. Natural materials like wood and stones found in an area could be exported across Europe. It could be that the stones had abilities with an even surface that could bring out the best performance. In the industrial evolution in chemistry scientist end inventors looked for abrasive materials that could be hard enough for cutting and sharpening of steel. These materials could be made with a high purity and could be used in combination with other substances to form stones for the industry and at home. Some of these materials and abrasive inventions could be found with scientific research and experiments in chemistry.